Summary: It is not a peaceful time in the Dells. The young King Nash clings to his throne while rebel lords in the north and south build armies to unseat him. The mountains an forests are filled with spies and thieves and lawless men. This romantic companion to the highly praised Graceling has an entirely new cast of characters, save one. You don't need to have read Graceling to love Fire. But if you haven't, you'll be dying to read it next. Summary: Iris is ready for another hot, routine summer in her small Louisiana town, hanging around the Red Stripe grocery with her best friend, Collette, and traipsing through the cemetery telling each other spooky stories and pretending to cast spells. Except this summer, Iris doesn’t have to make up a story. This summer, one falls right in her lap. Awesome. I love the cover of Fire and have been looking forward to reading it! Ooo lovely giveaway! Please enter me! sweet! Fire was an awesome read and I am dying to read Shadowed Summer! 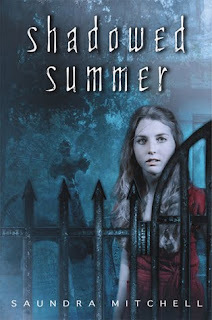 I'm waiting for Graceling at the library, and Shadowed Summer Sounds amazing! Oh I so want my very own copy of FIRE - count me in! AHHH! I've been wanting to read Fire! Oh my gosh! I want these so bad! This is great, i really loved Cashore's Graceling. OMG! I would love to win this one!!! Shadow Summer looks awesome! Fire too! I'm reading Graceling right now and love it; it would be awesome to win this pack!! Wow! Another great giveaway...I really want Fire and though I haven't heard of Shadowed Summer, it sounds really good. These look great. Count me in. Fabulous choices! Ahhh! Thank you again so much for all these great giveaways! Please enter me. I just finished Graceling and can't wait to read Fire! Awesome! I have Graceling and would LOVE Fire! Please enter me. Please enter me. I would love to win. Thanks for offering such a cool contest! Both are books I want to read! Please enter me!!! Awesome contest!! Enter ME! , awesome contest! I would love to read FIRE. Enter me please! Oh these both look fantastic, and right up my alley! What a wonderful prize pack, please count me in! I so want to read Fire! And Shadowed Summer sounds interesting! These both look so good, I don't know which I want more! I've heard Shadowed Summer is great. Count me in! I LOVE Fire but I don't own it :( Shadow Summer looks so good! Count me it! Ooh, I'd love to read FIRE and have heard a lot of good things about SHADOWED SUMMER. Ahhhh, this is amazing! Great contest! These look great. I'd love to win them. I think I NEED Shadowed Summer! Great books! Enter me please! I read graceling and fell in love and cant wait to read fire. i would love to win it and shadowed summer, both would be great books for me to escape in. thanks for the giveaway!!!! Please enter me! !